Chemicals used in manufacturing of pharmaceutical drugs are harmful for people working with them. Every harmful chemical has an occupational exposure limit that should be followed in industries. Occupational exposure bands are measures put in place to categorize chemicals so that the health of the worker is not compromised. This is because Active Pharmaceutical Ingredients can have serious and adverse effects on the worker when they become lowly airborne. They are usually classified on the potency of the exposure to the worker when exposed to the chemicals. The occupational exposure bands for pharmaceutical companies have been in use for a number of decades because of the rate at which new chemicals are introduced into the markets. This process was brought in because containing all chemicals was expensive and also very time-consuming. Therefore, having to just analyze the potency power of the chemical was easier and much cheaper. This has also become important in knowing where the product is listed when it comes to the hierarchy of all Occupational Exposure Limits. The main purpose of these exposure bands is to make sure that the safety of workers is ensured considering the fact that there are over 350,000 people working in pharmaceutical companies. That is why OELs have been developed in order to protect workers from dangerous exposures to hazardus chemicals. The pharmaceutical department is one that requires special attention considering the exposure workers face on a daily basis. Consistent exposure to this high set concentration levels of medicine can be harmful. It is of maximum importance that the pharmaceutical workers providing you with the solution to your health problem as well remains healthy. Considering the number of hours this professional has to spend administering medicine they are at a higher risk of illness from toxicity. The health specialist should have enough knowledge on how their health may be affected by exposure to the high levels of toxic compounds. It is important to put into consideration the amount of time they spend at work. Due to the need to want to protect the health practitioners the occupational exposure band for pharmaceutical drugs was set up. The occupational exposure band classifies chemicals into groups based on the occupational exposure limit. The occupational exposure band cares about how long workers may be exposed to the high-level concentration of compounds. This exposure may cause a number of health challenges namely; skin corrosion, eye damage, germ cell mutagenicity and skin sensitization. The occupational exposure band set out the OEL (occupational exposure limit) that sets to give a precise limit under which workers may still be safe working under. There are certain levels of airborne concentration for a specific time that workers may remain healthy. The standards are important as well as the occupational exposure set limits. The limits help by protecting workers who are in the environment of harmful chemicals from getting occupational diseases. Based on this being a professional field. The occupational exposure band has set out specific limits that are measured in mg/m3. This unit mg/m3 is especially used for compounds salts and metals that when placed under room temperature do not form vapors. There is another unit that is ppm. The ppm (parts per million) is especially for substances that under normal room pressure and temperature exists as vapor or gas. There are 5 levels of OEBs used to classify the chemicals. 1. 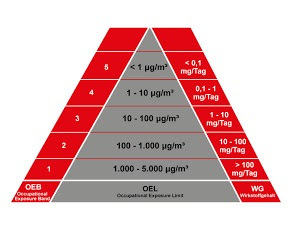 Level 1 OEB: This is the lowest form of containment as the chemicals do not pose any threat to the workers' safety. The only containment needed is just a local extraction and ventilation of the room. It has occupational exposure limit of 1000-5000 µg/m3. 2. Level 2 OEB: There is a minimal threat to the health of the worker and therefore steps should be employed in order to reduce the amount of exposure to the worker. This means that there should be a dedicated ventilation system for the room. It has occupational exposure limit of 100-1000 µg/m3. 3. Level 3 OEB: The material is potentially hazardous to the safety of the worker. Therefore measures should be put in place to prevent exposure. Liner systems are used to contain discharge while glove bags and flexible isolators provide a barrier. It has occupational exposure limit of 50-100 µg/m3. 4. Level 4 OEB: Chemicals of this level are hazardous to the safety of the worker. Therefore stringent measures should be put in place to prevent exposure. Physical barriers ought to be present between the worker and the chemicals and materials are handled in a dedicated enclosure using glove ports. At this level, Restricted Access Barrier Systems (RABS) are employed. It has occupational exposure limit of 1-50 µg/m3. 5. Level 5 OEB: Chemicals at this level are extremely hazardous to the worker. Therefore very stringent measures must be put in place to contain any form of exposure. Physical barriers ought to be present and they should be permanent. The chemicals should definitely be in a closed and isolated compartment with access only via glove ports. Even the chamber containing the chemicals should not be handled openly. It has occupational exposure limit of <1 µg/m3. The limitation of this process is that there are over 85,000 chemicals being commercially used and there are only just about 1000 chemicals that have OELs developed for them. This is because the number of chemicals being introduced far outpaces the OELs developed. Also, the validity of the data needed to create an OEL depends solely on the person using the process and thus might create room for inaccuracy.